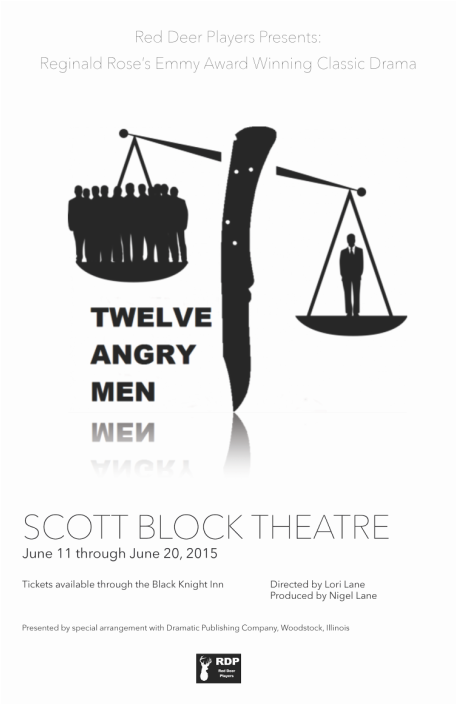 The Red Deer Players' last main stage production was Twelve Angry Men by Reginald Rose. This classic American drama is well known thanks to the renowned 1957 film production starring Henry Fonda. Red Deer's highly regarded Lori Lane directed the play. It was presented to nightly standing ovations at the downtown Scott Block theatre in June 2015. Lori began her community theatre journey in 1982 when she was one of a group of about five or six who set up a community theatre group in Wetaskiwin. She moved to Red Deer in 1985 and immediately became involved in Central Alberta Theatre (CAT) starting as an actor in both dinner theatre and musical productions. As is typical in community theatre, Lori then became involved on the technical side as a stage manager as well as doing sound & lighting before venturing into the world of directing. Lori's directorial career began with three year of formal training in the late eighties that introduced her to a field that soon became her passion. Lori took a break from theatre starting in 2000 to pursue her new passion as a “mom” to Owen – but before that, her final directorial credits were main stage productions of Evita! And Jesus Christ, Superstar. Since then Lori has previously only had the time to dabble a bit here and there through a small local comedy troupe. The Red Deer Players are delighted that Lori chose Twelve Angry Men for her grand re-entrance from that haitus.